Goodreads description--Alice doesn’t believe in luck—at least, not the good kind. But she does believe in love, and for some time now, she’s been pining for her best friend, Teddy. On his eighteenth birthday—just when it seems they might be on the brink of something—she buys him a lottery ticket on a lark. To their astonishment, he wins $140 million, and in an instant, everything changes. I have to say that I've read two Jennifer E Smith books in the past, but I didn't love her narration style in either of those books. Because of that, I almost didn't request Windfall for review, but the description won out. I've never read a book that was about a teen winning the lottery. And I have to say that Windfall is probably my favorite out of all of the Jennifer E Smith books that I've read. Alice, Leo, and Teddy are a trio of friends. Well Alice and Leo are cousins. But these three make up a best friend group. Leo is stereotypically gay. Because a girl can't be friends with a guy in YA literature these days without being in love with the guy or the guy being gay. And well Windfall has both of these stereotypes. *insert huge eye roll* Leo has some drama going on with his now-long-distance boyfriend. While Leo and Max aren't in the same geographical region during most of the book, their relationship does take up a decent portion of the storyline. Teddy seems to bit a part from Alice and Leo at the same time as being firmly a member of the trio. He's fairly popular with everyone at school since he plays sports. Alice has always been a bit separate. She sometimes considers herself to be an island, but that's mostly because she doesn't allow anyone close. This story is about what happens when you find yourself in possession of a large sum of money that you neither earned nor deserve. Because Teddy's grown up with limited financial means, having this money will not only make his life easier and allow his mom not have need to work as much, but when you throw a starving kid into a free-for-all candy store you can't expect them not to overindulge. It was also about witnessing someone you love be changed by money and what it can do. Yet really one of the the only constants in life is that life is always changing. Alice knows that better than anyone because her life has drastically changed twice. Once when her mother died, and then again when her father also died and she had to move across the country to live with her aunt, uncle, and cousin. Change has rarely been a good thing for Alice. So she's terrified of what this money will change in her life and Teddy's. I enjoyed the relationship between Teddy and Alice. These two are not shy about being honest with each other. Well except for Alice withholding her feelings for Teddy. They tell each other the hard truth--especially when it is most needed. Teddy seems to be a bit naive, and Alice a bit harsh. Yet they both underestimate each other at times. Even though Windfall is probably my favorite Jennifer E Smith book that I've read, I still had some issues with it. The typical gay best friend plus being in love with the other best friend annoyed me. Teddy's naivete in regards to all things money related for a large portion of the book was grating, as was Alice's hardened view on life. Yet the good thing was that Alice and Teddy both grew throughout the book which felt a bit redeeming. Still, Windfall gets 3.5 Stars from me. 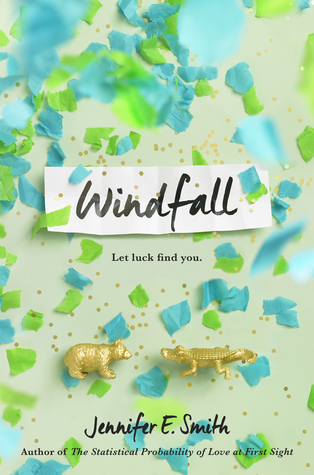 Have you read Windfall? What did you think? Let me know!